← Oh, My Sweet Goodness! Just a couple of weeks ago, from February 7th– 9th, The Roger Smith Hotel hosted its 3rd annual Cookbook conference. Held in the midst of a brewing winter storm “Nemo,” with threats of high winds, heavy snow and flight cancellations, only adding to the excitement that already filled the air. There’s always something happening in my NYC! I was ecstatic that I finally had the chance to attend. 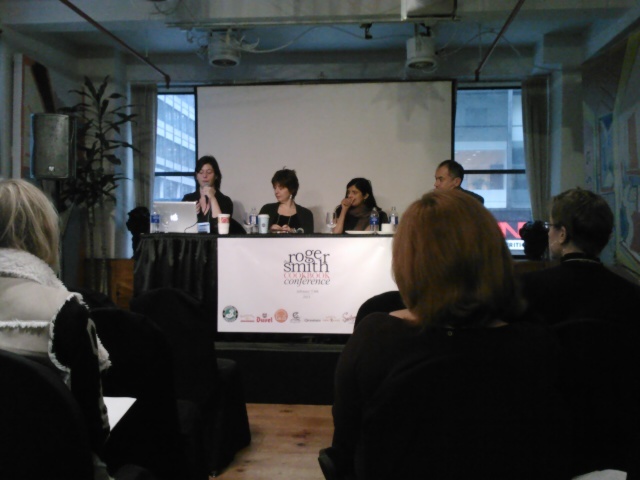 Kitchen Class Wars Panel lead by Linda Civitello, Najmieh Batmanglij, Poopa Dweck and Aylin Tan. The popularity of the food industry has peaked to new heights and I’ve never been more proud to be a part of a field where we hold the power to improve lives, one bite at a time. Food is life, and the old adage is true: we are what we eat, and how we eat is another story altogether. Our quality of life can be determined by diet. It has an effect on how we feel, both physically and mentally. There are new discoveries about food and nutrition popping up everyday. Stemming from how local and seasonal our food should be, the question of whether a particular food is organic or not, down to what pasture did that cow graze upon… where’s our food coming from?! With all these dietary restrictions and sudden influx of food allergies, (I’ve even developed a stupid peanut & walnut allergy out of nowhere) we have grown more concerned with the origins of our comestibles. Haven’t you noticed? It seems that almost everybody is allergic to gluten nowadays. I’m beginning to believe that even I might be developing a gluten intolerance. But maybe I’m paranoid and led by the power of suggestion? I will find out soon enough, though. Why is this happening?? As an individual with a new catering start up, and a strong desire to write a cookbook of my own, my intention is to seek every opportunity to learn as much as possible about the world of food, and contribute some of my own ideas. What better way to do this than by rubbing elbows with the experts? I want to surround myself with those who can enlighten me. This is why I was so eager to be a part of The Roger Smith CookBook conference. I must say, it was a learning experience to be savored. 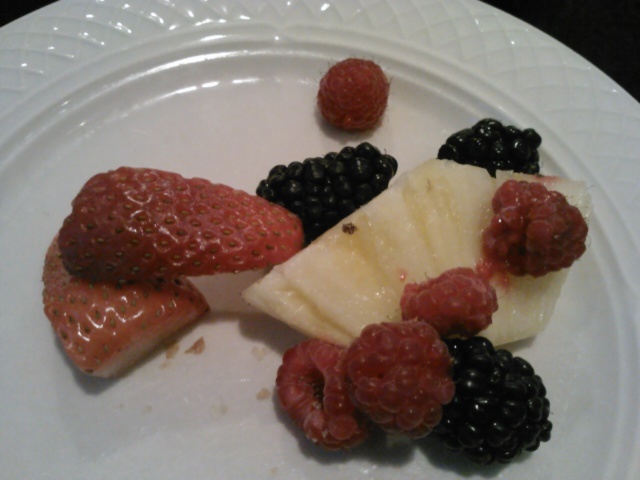 My mid- morning snack of fresh fruit. The Roger Smith Hotel was like a playground for me as I explored the different panels. 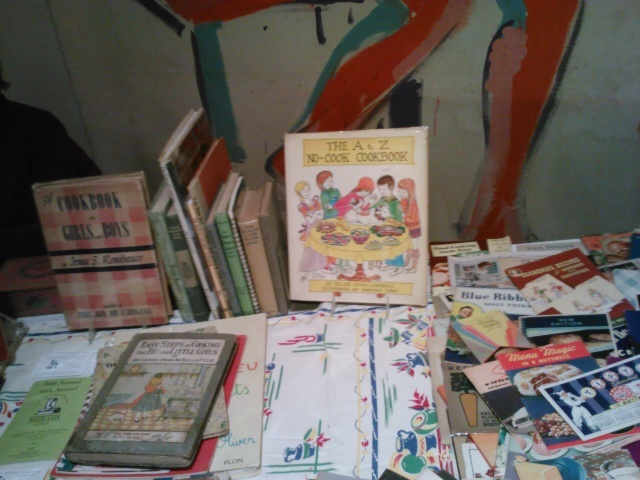 I was fascinated by all the topics, especially the discussion on Wartime cookbooks, all written during a time when people had to be creative with recipes due to the rationing of food. 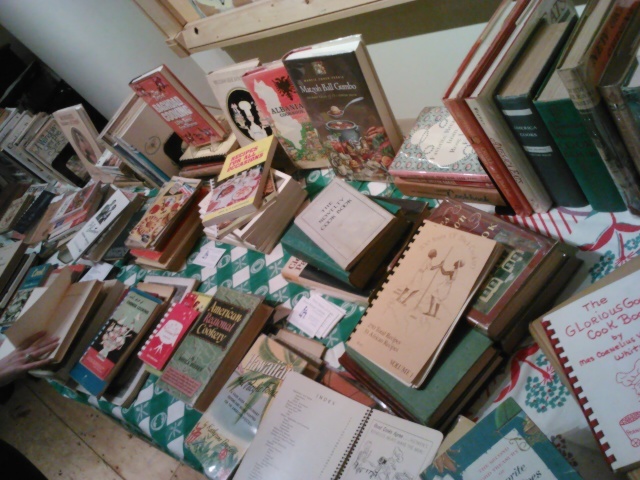 Just outside the Starlight room, there was a beautiful display of rare classic cookbooks, many of them out of print. There was also an assortment of pastries, fresh fruit and coffee available for us to nosh on whenever we wished. 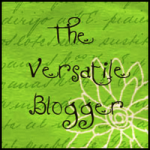 One thing that never occurred to me is to create my own recipe scrapbook, and I was inspired during one of the many interesting discussions. Now I have a use for all those recipes scribbled on coffee/ wine stained cocktail napkins and cutouts from magazines and newspapers. Yummy boxed lunches being stacked containing fresh fruit, salad and sandwiches for both the carnivore and the vegetarian. As a caterer, business woman, blogger, writer, chef, mixologist/ bartender and true lover of all things delicious and nutritious, I fully intend on making my mark in this vast world of food. I’ve always lived to make people happy, and now I want to make them happy & healthy. After all, that’s what this business is all about. Charming writing style! I walked past this hotel the other day. Interesting.